The monument was designed by Prof Mahmoud Hammad and Prof. Dr. (Architecture) Abdo Kass-Hout who won a competition organized by the Syrian Ministry of defense. 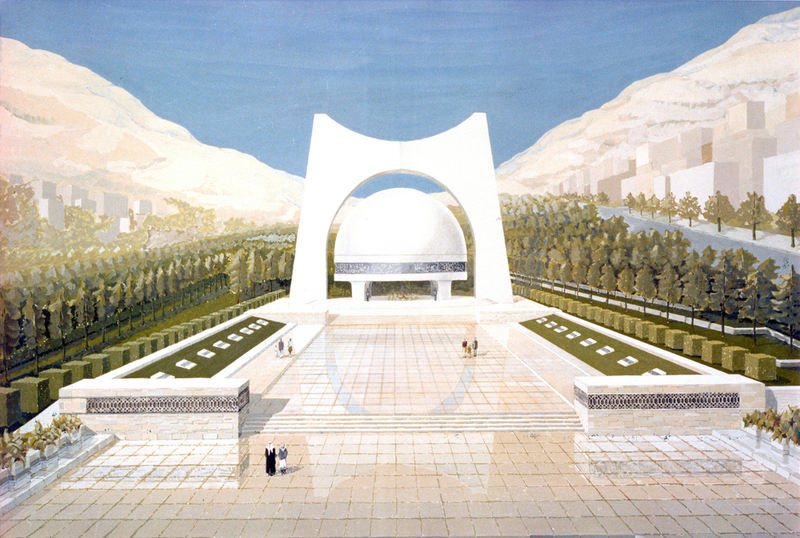 The monument features a dome, symbolizing the universe, and an arch , symbolizing victory. There is a hall under the dome, featuring five large paintings depicting battles from Arab and Syrian history: Battle of Yarmouk 636, Battle of Hettin 1187, Battle of Maysaloun 1920, Battle of Mount Hermon 1973 and Battle of Sultan Yakoub 1982. "Think not of those, who are slain in the way of Allah, as dead. Nay, they are living. With their Lord they have provision. Jubilant (are they) because of that which Allah hath bestowed upon them of His bounty, rejoicing for the sake of those who have not joined them but are left behind: that there shall no fear come upon them neither shall they grieve." Monument in Damascus International Fair . Monument in the Martyrs Cemetery, Najha .